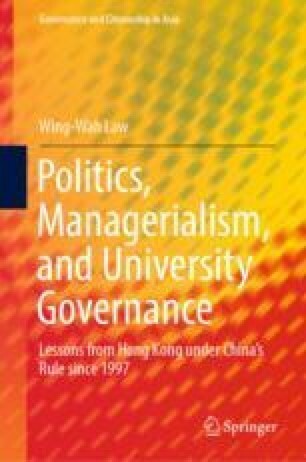 This chapter presents the political context of Hong Kong higher education under China’s rule, since 1997. This context is marked by increasingly intricate interactions and conflicts between Hong Kong and CPC-led mainland China. It shows that, in addition to worries about increased economic integration and dependency on mainland China, and escalated social integration of and conflicts with mainlanders, Hong Kong has faced three major political challenges to the “one country, two systems” principle, as it concerns the politics–university relationship; perceived threats to freedoms of speech and publication, and to media independence and pluralism; the clash between Hong Kong’s common law tradition and the mainland’s civil law tradition; and China’s increased political control over Hong Kong, and deliberate delays in introducing universal suffrage. These political concerns involve many Hong Kong people’s direct conflicts with the Hong Kong and central governments, resulting in tense central–local relationships and severe internal divisions between Hong Kong people. Both Hong Kong people and the central government see these conflicts as a challenge to the principle of “one country, two systems” and the Basic Law. Bland, B. (2017, February 4). Hong Kong in a corner after China’s raid on Xiao Jianhua. Financial Times. Retrieved from https://www.ft.com/content/71a7583e-e9fb-11e6–967b-c88452263daf. Cheung, T. (2016, March 26). Dropping word ‘National has been official practice for years, serving and former Hong Kong officials confirm. South China Morning Post. Retrieved from http://www.scmp.com/news/hong-kong/education-community/article/1930612/dropping-word-national-has-been-official-practice. Friends of Hong Kong Association Limited. (2017). Xuexiao Jiangzuo Xiangqing [Detail on School Talks]. Retrieved from http://www.fhka.com.hk/zh-hant/tsdetail. Global Times Editor. (2016, January 6). Xianggang Shushang Peihe Diaocha Zhenshi Bei Chaozuo Waile [Hong Kong Booksellers Assisting in Investigation Was Speculated and Distorted]. Huanqiu Shibao [Global Times]. Retrieved from http://opinion.huanqiu.com/editorial/2016-01/8323385.html. Hong Kong Government. (2016a, July 1). Government responds to July 1 procession. Retrieved from http://www.info.gov.hk/gia/general/201607/01/P201607010633.htm. Hong Kong Government. (2016b, June 20). Transcript of remarks by CE and S for S. Retrieved from http://www.info.gov.hk/gia/general/201606/20/P201606200446.htm. Hong Kong Government. (2017b, October 6). HKSARG responds to US report. Retrieved from http://www.info.gov.hk/gia/general/201710/06/P2017100600082.htm. Hong Kong Government. (2017d, December 29). Response of the HKSAR government on co-location arrangement. Retrieved from http://www.info.gov.hk/gia/general/201712/29/P2017122900853.htm. Hong Kong Government. (2017e, September 14). Response to UK report on Hong Kong. Retrieved from http://www.info.gov.hk/gia/general/201709/14/P2017091400653.htm. Hong Kong Government. (2018, November 6). Response by CS at UNHRC universal periodic review meeting. Retrieved from https://www.info.gov.hk/gia/general/201811/06/P2018110600982.htm. Kraar, L., & McGowan, J. (1995, June 26). The death of Hong Kong. Fortune. Retrieved from http://archive.fortune.com/magazines/fortune/fortune_archive/1995/06/26/203948/index.htm. Ming Pao Reporter. (2018, June 2). Teshou Sansi Shisanju Shouzhang Ju Gebie Biaotai [The chief executive and her officials refused to comment]. Ming Pao [Ming Pao News]. Retrieved from https://news.mingpao.com/ins/instantnews/web_tc/article/20180602/s00001/1527937163075. Radio Television Hong Kong. (2018, May 28). San Zhong Shang [Three leftist publishers]. Hong Kong Connection. Retrieved from http://www.rthk.hk/tv/dtt31/programme/hkcc/episode/494749.